Where do Anesthesiologist Assistants practice? Where do our students complete their clinical rotations? The Master of Science (M.S.) 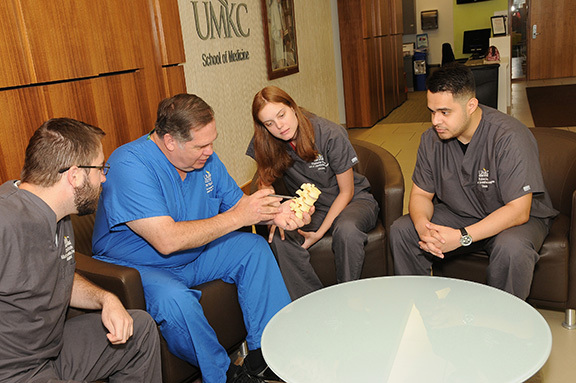 in Anesthesia program at UMKC School of Medicine is a nationally accredited 29-month (7 consecutive semesters) program that integrates didactic and clinical instruction. With a January start date, the first year (semesters 1 to 3) is referred to as the didactic phase. A significant portion of the credit hours involve foundational medical science coursework, however; students also gain clinical experience in both the skills/simulation lab and the operating room. This combination of classroom and clinical learning is an integral component of the program. Classroom instruction includes advanced coursework in applied anatomy and physiology, physics, pharmacology, and anesthetic sciences. 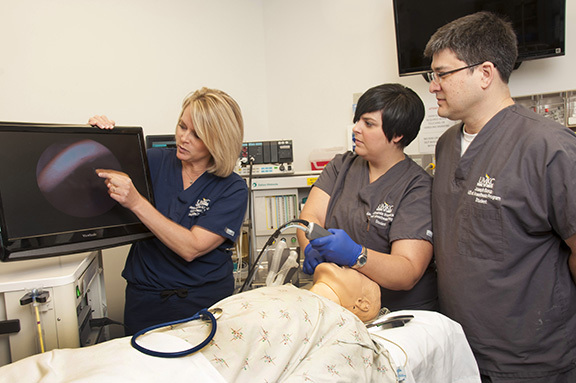 Simulation labs are incorporated early to emphasize patient instrumentation and monitoring, as well as technical skills required for the profession. Students will receive more than 100 hours of training during their first year in our state-of-the-art skills/simulation laboratory. Clinical work begins in the first semester, with incremental increases each semester. Semesters 4 to 7 are considered the clinical phase of the program. Students primarily focus on gaining clinical experience within an operating room. One-on-one supervision by an Anesthesiologist or a licensed Anesthesiologist Assistant is provided. During the clinical rotations students apply the medical knowledge and clinical skills gained during the didactic phase and gain competence in providing direct patient care. Upon graduation, students will have completed 113 credit hours, experienced more than 2,000 patient contact hours, and administered anesthesia to more than 700 patients. The clinical rotation schedule ensures experience with the specialties involved in anesthesia including pediatrics, cardiac, obstetrics, neurosurgery and trauma. Rotations during the clinical phase will include some out of town and/or out of state clinical training sites of an affiliated hospital. The curriculum schedule and course descriptions are outlined below. A one credit hour course designed specifically for anesthesiologist assistants. Anatomical terms, structures, and relationships emphasizing functional significance in problem solving situations. Laboratory provides demonstrations using models and other learning modalities. In this course, students will learn to apply the anatomy that directly impacts clinical situations. Diagnostic skills will be enhanced through an understanding of radiologic tests, identification of common chest X-rays, and a basic understanding of transesophageal echocardiography. Students will learn to recognize the basic 4 chamber TEE views and diagnose the most common lesions and abnormalities in patients undergoing cardiac surgery. An ultrasound machine will be used to identify anatomy for a variety of clinical procedures, including intravenous line placement, central line placement, arterial line placement, and peripheral nerve block placement. Students will learn the principles of how to operate and manipulate the ultrasound monitor, and will learn the relevant anatomy and anesthetic implications and management for the most common peripheral nerve blocks used today. In addition, clinically significant anatomy case studies in anesthesia will be presented and discussed. This is a 0.5 credit course required in the first three semesters of the program which involves detailed study into special areas of Anesthesiologist Assistant practice; including professional behavior towards colleagues and patients, psychological considerations in providing anesthesia care, ethical considerations in medicine, and diversity, legal obligations of anesthetists and the rights of their patients, and the social and community contexts of health care. It further details the need for lifelong commitment to self education in the practice of anesthesia and positive advocacy of the anesthesiologist assistant profession. This is a three credit hour course which integrates concepts of circuits and engineering with the clinical application of anesthesia instrumentation. Monitors and devices used in the operating room are studied with respect to principles of operation, calibration, and interpretation of data. A hands-on laboratory is used to maximize direct contact to the instrumentation of the profession. This course addresses intraoperative monitoring for complicated patients and complex surgical procedures. Advanced and supplemental monitors and devices used in the operating room are studied with respect to principles of operation, calibration, and interpretation of data. Includes focus on diagnosis and practical applications of electrocardiography (ECG), echocardiography and other advanced cardiovascular monitoring techniques used in the operating room. This is a 0.5 credit hour course taken in the final semester of the Master of Science in Anesthesia Program. This course is designed to prepare the student for the job market and placement. The course will contain information on student loan payback, financial literacy after graduation, and leadership opportunities for the graduate. The course will also clinically update the students in basic life saving for the healthcare provider (BLS), advanced cardiac life saving (ACLS) and pediatric advanced life saving (PALS). These courses were designed specifically for the Masters of Anesthesia Program. Students learn basic and applied human systems physiology with emphasis on topics and areas of special concern to the anesthetist. These courses provide an essential anesthesia link to the basic anatomy and physiology classes in the Masters of Science in Anesthesia program. The content outline intentionally corresponds with and builds upon that of the Physiology for Anesthesiologist Assistants coursework. 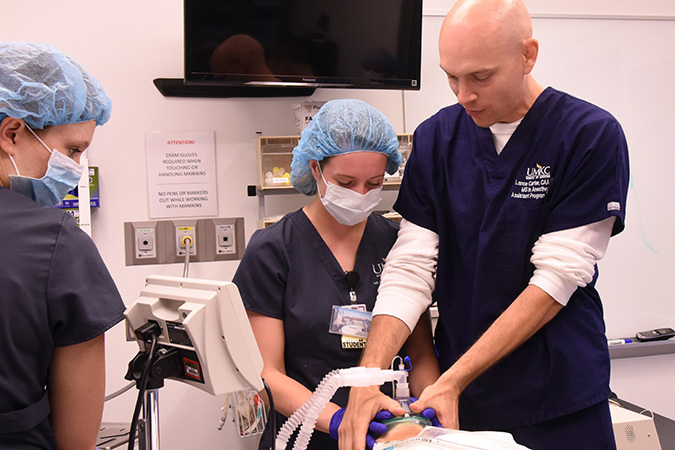 This two credit hour course prepares students for practice in anesthesia by introducing basic concepts and necessary skills. It also provides intensive instruction regarding: Medical terminology and abbreviations, medical record and medical history interpretation, and documentation skills. A skills lab based course to prepare students for anesthesia patient care in the operating room. Classroom, simulation laboratory and actual operating room environments will be used to teach preoperative assessment, IV placement techniques, airway management, intraoperative patient care and post-operative management. BLS (Basic Life Support) certification is a course requirement. A continuation of ANES 5561 with increasing clinical experience each semester. Laboratory work focuses on refining patient management skill, establishing independence in performing basic tasks and introducing advanced skills. Students gain additional clinical experience in the operating room. In this course it is expected students will be successful in performing basic clinical competencies with minimal assistance from clinical instructors, while attempting advanced competencies with frequent assistance. This one credit course is designed to help students understand how to effectively research and apply current anesthesia journal articles, and to prepare for the NCCAA certification examination. The students will spend the entire semester studying specific topics of the 16 focus areas that are included on the NCCAA certification examination. Homework will include submission of test questions based on their presentations and the assigned NCCAA testing topics. The students will also receive an assignment to find and summarize a journal article from a specific aspect of anesthesia. The students will cap off the semester with a clinical final examination, which includes submitted questions from assigned topics. Clinical correlation II includes an IT week provided at the School of Medicine. These are clinical clerkships, where students are in the operating room (OR) five days per week and through the combined clinical experience clerkships will receive extended exposure to all clinical subspecialties. Students complete 4 week or 8 week rotations at several area hospitals to gain experience with general surgery, obstetrics, pediatrics, trauma surgery, neurosurgery, cardiovascular surgery, orthopedic surgery, and others. Students are expected to perform basic clinical competencies with minimal to no assistance from clinical instructors, while attempting advanced competencies with frequent assistance. These courses specifically designed for the Master of Science in Anesthesia program will introduce the student to basic concepts in pharmacology: principles of drug action, receptor theory, pharmacokinetics, and pharmacodynamics. The courses will emphasize those medication classes most commonly encountered within the practice of an anesthesiologist assistant including anesthetic agents (inhaled, intravenous, local), analgesics, cardiovascular agents and intravenous fluids. These are two credit hour courses, which utilize physiological model-based simulation and procedure simulation to integrate anesthesia-associated basic science knowledge into a laboratory setting. Students practice basic manual skills in: anesthesia machine checkout, anesthesia materials and equipment setup and performing anesthesia for uncomplicated surgical cases using clinical models and simulators. Students are also introduced to anesthesia machine troubleshooting and crisis management. This one semester course introduces the student to clinical research in medicine and its application to clinical decision making through the concepts and principles of evidence-based medicine. Additionally, the course will provide the student with the skills to complete a written research project through the investigation of a clinical topic utilizing the medical literature. In addition to the lecture, students will participate in small group assignments designed to provide hands-on experience in research design, analysis, and evaluation of published literature. Will also include instruction and utilization of the Health Sciences library and associated resources.